The Sea of Cortés (Gulf of California) is one of the world’s top five seas in terms of ecological productivity and biological diversity. The region is world famous for its recreational sports fishing. Among rivers feeding the Sea of Cortés are the Colorado, Fuerte and Yaqui. Its coast includes more than 300 estuaries and other wetlands, of which the delta of the Colorado River is especially important. The vast reduction in the Colorado’s flow has negatively impacted wetlands and fisheries. These wetlands are also threatened by the development of marinas, resorts and aquaculture, especially shrimp farms. The plant and animal communities in these wetlands provide a constant supply of nutrients which support large numbers of fish and marine mammals. These include the humpback whale, California gray whale, blue whale, fin whale, sperm whale and the leatherback sea turtle. Wetland degradation and declining fish stocks have had inevitable consequences on many marine mammals. Concern over endangered mammals such as the vaquita porpoise, which is endemic to the area and was being taken as by catch in gill nets, led to the establishment of the Biosphere Reserve of the Upper Gulf of California and Delta of the Colorado River in 1993. The Biosphere Reserve aims to protect breeding grounds and conserve endangered species, including the vaquita, the totoaba, the desert pupfish and the Yuma clapper rail. This was the first marine reserve established in Mexico; several other marine protected areas has since been established on Mexico’s other coasts. Did changes in technology hasten the decline of commercial fishing? In the Sea of Cortés, changes in technology, coupled with high demand for fish (especially in Japan), and greed, help to explain the demise of fish stocks. Commercial shrimp fishing started here in the 1940s. The introduction of outboard motors in the 1970s allowed small fiberglass boats (pangas) to travel further afield in search of fish. Up to 20,000 pangas using gill nets had an immediate adverse impact on fish stocks, with large decreases in roosterfish, yellowtail and sierra mackerel. In the 1980s, as the sardine stocks close to Guaymas had been depleted, new sardine boats were built with refrigeration facilities which allowed them to catch sardines further offshore, in their feeding grounds near Midriff Island. In the 1990s a longline fishing fleet began to operate out of Ensenada. Licensed boats were required to fish beyond a non-fishing zone extending 80 km (50 mi) from the coast. A single longline boat may have 5 km (3 mi) of line with 600 to 700 baited hooks in total. The swordfish populations outside the protected zone were quickly depleted, leading fishing boat owners to apply for permits to catch shark inside the 80-km limits. The Sea of Cortés faces numerous pressures. Decades of commercial overfishing are causing a total collapse of fish stocks. As late as 1993, the area, less than 5% of all Mexico’s territorial waters, produced about 75% of the nation’s total fish catch of 1.5 million metric tons; however, by some estimates, fish populations have declined by 90% since. Reversing decades of overfishing requires more effective enforcement of fishing regulations, especially the 80-km zone of no commercial fishing; vessel monitoring systems; a ban on the use of gill nets; and a prohibition on the catch of certain fish such as bluefin tuna. Fish farming may be a viable alternative and several commercial tuna farms, where wild tuna are raised in near-shore pens, have been established in Baja California but more research on the ecological pros and cons of establishing such farms is urgently needed. In our next post, we will take a closer look at some recent research connected to the restoration of fish stocks in this region. The commercial greenhouse production of horticultural crops in Mexico started in the 1950s, with floriculture (flower-growing) operations. It then expanded to include some vegetables in the 1980s. During the 1990s, larger, more modern greenhouses were introduced specializing in the growing of vegetables for export markets. In 1991, Mexico had only 51 hectares of vegetable production in greenhouses. The signing of NAFTA in 1994 stimulated increased investment in Mexico from Israel, Holland, and Spain in greenhouse systems designed to boost vegetable production for the US market. The area of greenhouses has risen rapidly since then to about 2,400 hectares in 2009, almost double the area recorded for 2005, and including 1,000 hectares devoted to flowers. What are the advantages of production using greenhouses? What are the disadvantages of production using greenhouses? 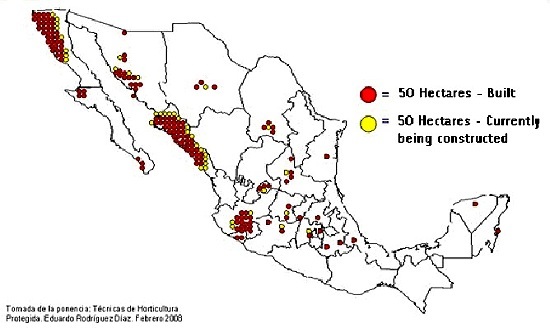 Where are most of Mexico’s greenhouses located? Combined, these five represent 84% of the total greenhouse production of vegetables. One clear trend is that the area of all these crops is expanding very rapidly. For instance, from 2007 to 2008, the area devoted to the greenhouse production of tomatoes rose 19%, while chiles and cucumbers rose 35% and 29% respectively. 95% of Mexico’s greenhouses are plastic, rather than glass, mainly because the extra insulation afforded by glass is not required in most parts of Mexico given the climate. Many greenhouses are now made in Mexico, but others are imported from Israel, Canada, the Netherlands, Spain, France and the USA. Many of the greenhouses are high-roofed, between 4 and 5 meters tall. A basic greenhouse structure covering 1 hectare (2.4 acres) costs about $160,000, excluding the cost of any irrigation system. Because financing is difficult to obtain in Mexico, many producers rely on relatively low-cost plastic greenhouses, which do not usually have any heating systems. Some newer models have hot water or gas heating systems which guarantee that crops can be timed to coincide with peak demand during the US winter. In an effort to hasten the adoption of improved horticultural technology, the Agriculture Secretariat (SAGARPA) has started a shared-risk fund to encourage greenhouse installation, provided it is to grow crops other than tomatoes, including herbs, chiles and lettuce. Besides initial costs, another major constraint on the expansion of greenhouse systems in Mexico is distance from the main markets north of the border. From some areas, reaching markets in California requires a 36-hour truck ride. Any delay means that the crop will not arrive in optimum condition. Another limitation which restricts the universal adoption of greenhouses is that they generally need a good supply of water. This is not always easy (or cheap) to obtain, especially in arid areas such as Baja California. Finally, as with most farmers, greenhouse operators in Mexico face competition from growers in other countries, and also have to contend with market volatility (whether real or perceived). Lopez, J. and K. Shwedel. 2001. The Mexican greenhouse vegetable industry. Industry Note 032-2001, 5 pp. Mexico’s Agriculture Secretariat (SAGARPA) has refused permission for transnational seed firm Monsanto to undertake larger-scale field trials of its GM corn in Sinaloa, and is opposing similar projects involving transgenic corn in Sonora and Tamaulipas. Monsanto is appealing SAGARPA’s initial decision. The other firms hoping to hold second-stage trials besides ﻿Monsanto are Dow Agrosciences (a unit of Dow Chemical Co.) and Pioneer Hi-Bred International (currently owned by DuPont). What would Yum Kaax, the Mayan god of corn, think about GM corn? As we noted in “The debate over GM corn in Mexico“, Mexico does not yet permit the commercialization of any genetically-modified corn, but Monsanto is betting on a relaxation of current rules as Mexico currently has to import large volumes of corn each year in order to satisfy domestic demand. Mexico’s corn imports are expected to rise from 10 to 15 million metric tons by 2020. Corn prices are also likely to rise since an increasing portion of the annual US corn crop is destined for biofuel production rather than human consumption. Monsanto argues that Mexico cannot guarantee its future food security unless it embraces the new agro-technology, and is threatening to withdraw 200 million dollars in planned investments over the next five years. ﻿A dozen agricultural organizations in the northern Mexico states of Sinaloa, Sonora, Chihuahua and Tamaulipas, have come out in support of Monsanto’s efforts to introduce transgenic corn, arguing that it is the best way for them to increase productivity and therefore becomes more competitive. The growers’ organizations claim that introducing GM crops has given their commercial competitors a competitive advantage in the marketplace. The Agriculture Secretariat’s position reflects the concerns of farmers in other regions and ecologists who fear that the introduction of GM corn will displace or eradicate some of Mexico’s existing (non-GM) varieties. Protecting existing varieties of corn is the major motive behind the declaration by the governments of the Federal District and the state of Tlaxcala that their jurisdictions are “GM-free zones”. ﻿INEGI figures published at the end of 2009 show that, as of July 2009, Mexico now has 27.2 million internet users (21.7% higher than a year earlier). Nationwide, 7.4 million homes have a computer (26.8% of the total number of homes – this is 4.6% more than in 2008). Of these homes, 5.1 million have an internet connection (18.4% of total, and up 36.4% compared to 2008). The majority of internet users are youth and young adults (ages 12-34) where 70% have access. Of all internet users, 53% use the internet for education, 40% for games/entertainment; 35% for communication and 30% for work. Of families with internet, 74.8% (3.9 million homes) have broad band access; the remaining 23.7% still rely on internet via telephone (this method was used by a majority even just 2 years ago).